Caterpillar, Inc. manufactures construction and mining equipment; diesel and natural gas engines; and industrial gas turbines. It operates its business in Machinery, Engines, and Financial Products lines. Caterpillar was founded in 1925 and is headquartered in Peoria, Illinois. 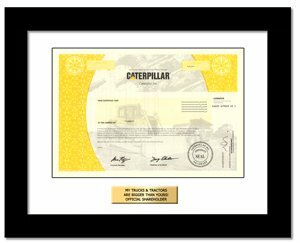 A share of Caterpillar is a favorite for the manly man or the kid that loves to play with tractors and trucks.